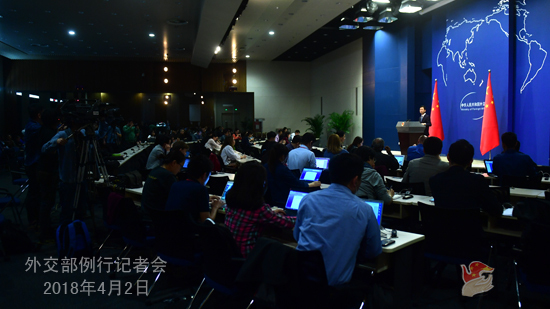 Q: The Chinese government today announced that Tiangong-1 has reentered the atmosphere and gave a position in the South Pacific Ocean. Some foreign astronomers say that it probably fell close to the French island of Tahiti. Do you have any details about where exactly in the South Pacific Ocean the remains of the Tiangong-1 might have fallen? A: The China Manned Space Engineering Office released relevant information today. I believe you must have read it. I have no further details to add. I would like to stress that China always attaches great importance to the reentry of the Tiangong-1 space lab into the atmosphere and has been handling it in accordance with relevant international conventions and practices and in a responsible way. We have briefed the United Nations Office for Outer Space Affairs several times to keep the relevant information open and transparent. Q: News broke out this morning that Carlos Alvarado of the ruling Citizen Action Party of Costa Rica won the presidential election. What is your comment? A: Costa Rica's Supreme Electoral Tribunal has announced that candidate of the Citizen Action Party Carlos Alvarado won the presidential election. As a good friend and partner of Costa Rica, China would like to extend its warm congratulations to Mr. Alvarado. We believe that under his leadership, the government and people of Costa Rica will make new strides in their cause of national development. China stands ready to work with Costa Rica to deepen friendly cooperation in various fields and move forward China-Costa Rica strategic partnership featuring equality, mutual trust and win-win cooperation. Q: Also on the reentry of Tiangong-1, can you confirm that its debris fell in the waters of the South Pacific Ocean? Have all of its parts burnt up during the reentry? A: Just like what I just said, the China Manned Space Engineering Office has released relevant information. To recap, through monitoring and analysis by the related agencies, Tiangong 1 re-entered the atmosphere at about 8:15 am, 2 April, Beijing time (1.15am GMT). The re-entry falling area is located in the central region of the South Pacific Ocean. Most of the devices were ablated during the re-entry process. I believe these descriptions are rather explicit. Also I have learned that so far there has been no impact on the ground. Follow-up: can I infer that China has confirmed that this reentry has caused no damage at all? A: To repeat, my information is that no damage to the ground has been found. Q: Last week, University of Central Florida police made public a case involving a 26-year-old Chinese student. The police said that the student, who was detained in early February for visa issue, will be deported because the immigration officials believed he violated relevant laws. The police also said that he will be deported because he bought two semiautomatic rifles and ammunition, and his classmates reported his distressing behavior to the school. Do you have more information on this case? Have you provided consular protection to him? What is your response to the police statements? A: I have no information on that. I need to look it up for you. 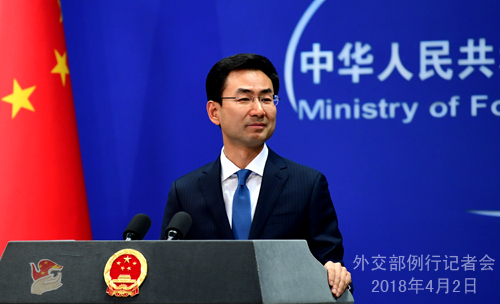 The Foreign Ministry will hold a press briefing to the Chinese and foreign press at 9:00 am, 3 April (Tuesday), in the Blue Room. State Councilor and Foreign Minister Wang Yi will be here to brief you on the Boao Forum for Asia Annual Conference 2018. We look forward to seeing you here tomorrow morning. The regular press conference for tomorrow afternoon will go on as usual.